Shanta and Devonte went to culinary school together, and they met in “Tea, Coffee, and Nonalcoholic Beverage” class. It’s a hard class subject to forget. At first, they were simply friends, but this turned into a relationship, and two years into it he proposed. Shanta was expecting it some, as she saw jewelry charges on his bank account, but was still surprised once she put two and two together. After looking at local venues in Charlotte, they realized they were far too expensive. 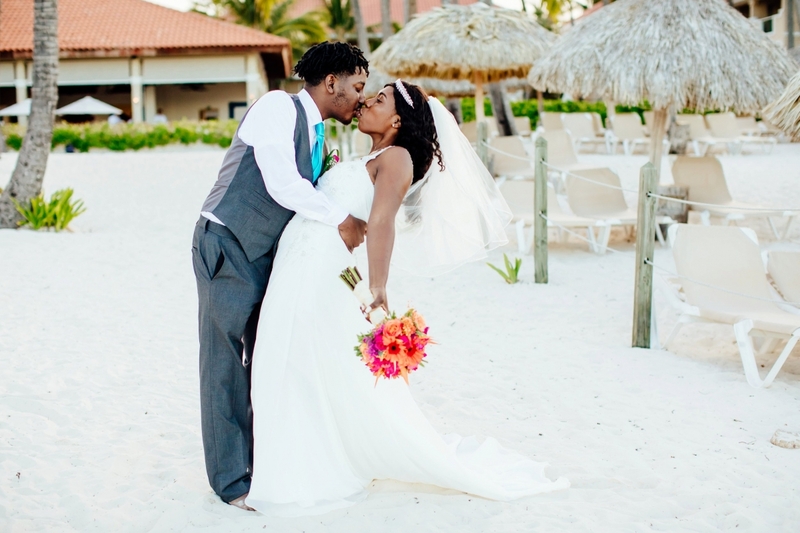 With a destination wedding, Shanta said, “You get more for less”. Together with their Destify agent Ann they chose Dreams Palm Beach. They liked that it was in Punta Cana, a tropical location that was also very family-friendly. The couple used the Dreams’ wedding department, along with a stateside wedding planner, who coordinated much of the communication in regards to planning. Once on site, the couple said their coordinator Leslie was great to work with, the process was simple and easy. They spent the first day exploring the resort, and then met with her the next day and finalized the menu and last minute details. None of their family members had been out of the country so it was a great new experience for everyone. Before the wedding the couple walked through everything with their coordinator, seeing the beachfront where the ceremony would be held, and hosting a dinner rehearsal. The day of the ceremony was very relaxed, they spent the day enjoying the resort with family until it was time to get ready. After the beautiful beach ceremony, they immediately held a cocktail hour with appetizers. The party didn’t stop there. Afterward, the couple hosted a dinner reception at one of the resort’s signature restaurants, and then most of the bridal party and younger guests took a late night excursion to Punta Cana’s Imagine nightclub, built within a series of caves. For their entire stay, the couple loved how special the service at the resort made them feel, from room upgrades to roses and romantic turndown service. The couple recommends having a stateside planner too if you’re able too, it helped to better coordinate their vision. Shanta recommends not investing too much in sit down dinners, as with an all-inclusive it’s already free, and they do their best to coordinate your groups together at each restaurant. It was so nice to say, just make it beautiful and we’re happy!